The June 2018 provincial election is more than a year away, but there are already signs of pre-election fever. Look for them in the upcoming Ontario provincial budget. You see evidence of pre-election fever in the flurry of announcements coming out of the Premier’s office on everything from hydro affordability to attempting to calm the Golden Horseshoe’s housing market. Meanwhile, the provincial NDP is releasing this “vision” paper, which looks a lot like a pre-election document. And on my Twitter feed, I just saw the first “attack ad”, which asks where Progressive Conservative Leader Patrick Brown’s hydro plan is. So don’t be surprised if the April 27 Ontario provincial budget looks more like a pre-election budget from a government that is low in public popularity (according to the polls) and trying to make a comeback. As a result of the global economic meltdown of 2007-08, Ontario’s finances plunged into a fiscal deficit 10 years ago. It’s been a long, painful haul out of that deficit. In the early days of that global economic shock, the province did the right thing by rejecting austerity. For instance, it invested in measures to reduce family poverty and it proceeded to roll out its early childhood learning program. But by 2012, the McGuinty government started to get itchy feet about its deficit. Prompted by a report by former banker Don Drummond, which recommended 362 bitter pills to swallow in the form spending cuts, Ontario plunged into five years of austerity. Public sector workers had done nothing to cause the recession, nor the deficit, yet they were dealt multiple years of wage freezes. 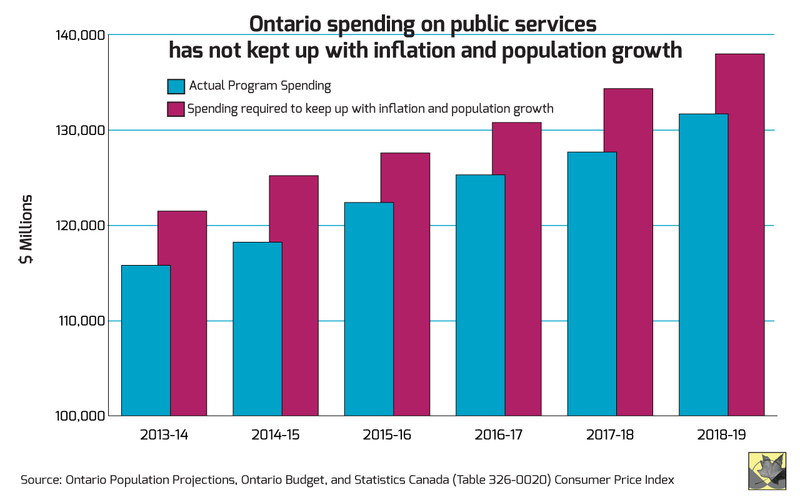 The province also placed constraints on public program spending: it lags behind inflation and population growth, as you can see in this chart produced by CCPA-Ontario Senior Economist Sheila Block. In the April 27 Ontario provincial budget, the government will announce it has finally managed to balance the budget. Will the government use this moment to, at minimum, bring program spending in line with inflation and population growth? Will it take measures to make up for multiple years of neglected investments in things like health care, education, and supports for low-income Ontarians? Will the government use this moment to address its revenue problem? Amid news stories of crowded hospitals, there are expectations that the government will increase resources for health care, which suffered under the austerity agenda. For instance, the government announced in February that it will ease its four-year freeze on hospital budgets. That can’t happen soon enough. 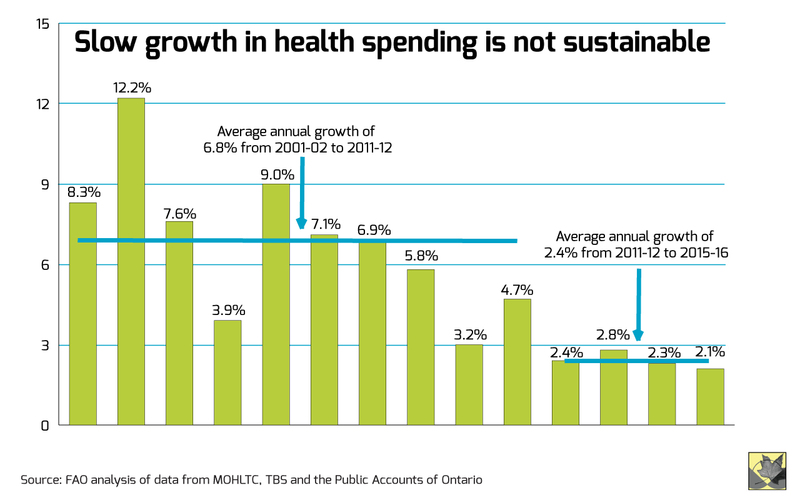 Average annual growth in health care spending between 2011-12 and 2015-16 remained suppressed at an average of 2.4 per cent. That’s considerably down from the 6.8 per cent average increase between 2001-02 and 2011-12. Considering real-time pressures, such as population growth and an aging baby boomer generation, spending constraints like this simply aren’t sustainable. They will only lead to more stories of over-crowded hospitals and patients not getting the health care they need. Meanwhile, news of school closures is causing great concern in communities across Ontario — not exactly a prime election backdrop for a government trying to make a comeback. And given the fact that many Ontario cities are home to the most expensive child care fees in Canada, there is increasing pressure on this government to get bolder about creating more affordable child care spaces. In September of last year, the province committed to creating 100,000 new licensed child care spaces over five years. But the Ontario Coalition for Better Child Care is also calling on the province to set an affordable, geared-to-income sliding fee scale. Will these issues be sufficiently addressed in the April 27th Ontario provincial budget? That remains to be seen. There is more than one political fire that this government is attempting to put out. Which takes us to hydro bills. The government has been trying to dampen criticism about its handling of the hydro file, with its announcement to cut average hydro bills by 25 per cent. That comes with a hefty price tag: up to $2.5 billion and counting. The government is also trying to address mounting concerns that housing and rental prices in the Golden Horseshoe, and especially in Toronto, are out of control. Premier Kathleen Wynne has announced 16 measures, including a commitment to close the gaping loophole that lets landlords charge whatever rent they want to tenants in buildings built after 1991. Now rent regulation will apply to everyone. But the potential effectiveness of the government’s promise to invest $125 million over the next five years to encourage construction of new rental apartments is murky, according to this smart take by TVO’s John Michael McGrath. Rather than subsidizing developers, that money could be better spent on investing in the social housing supply. Just this week, it was announced that some Toronto social housing units will close because they are beyond repair. The price tag to fix crumbling social housing units keeps rising. That’s what happens when governments neglect a problem for so long. Will the provincial government step up as a senior partner with the city? Meanwhile, there are previously announced commitments that need dollars attached to them if they are to become a reality. For instance, the government is expected to announce details of its promised basic income pilot project. But will this year’s budget also make progress on closing the huge gap between social assistance income and the poverty line? In a CCPA-Ontario report by Kaylie Tiessen, we reported that the poverty gap for single individuals who qualify for Ontario Works or its equivalent has increased by almost 200 per cent since 1993. Now that Ontario has achieved its balanced budget goal, will this government make the public program investments needed to live up to its poverty reduction goals and its “activist government” marketing? In order for this government — or any of the opposition parties, for that matter — to present a big picture vision to the electorate in the coming year, it will require acknowledging the guerilla in the room. Ontario has a revenue problem, which has been mostly self-inflicted. Since the mid-1990s, Ontario politics have been defined by a major tax cut addiction. All the parties offer them. Thanks to tax cuts, CCPA Research Associate Hugh Mackenzie estimates the province loses out on a cumulative of $19 billion in annual revenue. $19 billion can buy a lot of good investments in the people of this province. There have been modest first steps. In 2014, Ontario raised marginal income taxes on the richest 1%. Sheila Block has documented how making the province’s personal income tax system more progressive is actually working. But there’s room for increasing the marginal income tax on the richest 10 per cent — not just the one percenters — and polls show the public is on side with that in order to combat income inequality. The only shortcoming here is that taxing the rich isn’t adequate enough to raise the kind of revenue needed to make social and public investments that have been delayed for far too long. You need to look at undoing more than one tax cut. Corporate income tax: Reverse the 2.5 percentage point reduction in the corporate income tax that took place in 2009. That could raise over $2 billion in revenue. And it would still leave Ontario with lower corporate income tax rates than comparable jurisdictions. Sales tax: Take up the room in the HST vacated by the Harper government by increasing sales taxes. Increasing the sales tax credit to offset regressivity would do some heavy lifting. Tax loopholes: The government could look at closing more tax loopholes, which would increase revenues, fairness, and simplicity all at the same time. For the record, we also approve of Ontario Finance Minister Charles Sousa’s attempt to convince his federal counterpart to raise the capital gains inclusion rate for non-principal homes to discourage housing market speculation. No politician likes heading into an election year on the promise of tax increases, but if all parties insist on ignoring Ontario’s revenue problem after a couple of decades of tax cuts, we can predict our future based on the past. Without undoing some of those tax cuts and closing tax loopholes, more austerity will be on the way — despite whatever pre-election politicians of all partisan stripes promise.